Sepiateuthis lessoniana Lesson 1830. 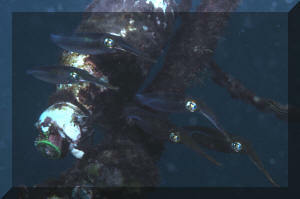 Bigfin Reef Squid. Recognized by its long body-length finnage. Found near the surface to 100 meters. Indo-Mid-Pacific; Red Sea to Hawai'i. S. Sulawesi, Indonesia pic. Sepiateuthis sepioidea Caribbean Reef Squid. Most common species in the TWA. 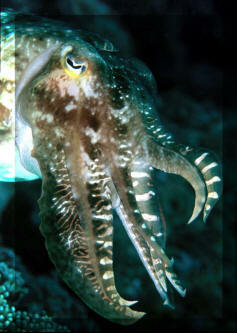 Continuous fin around body; short tentacles. Roatan 2019. 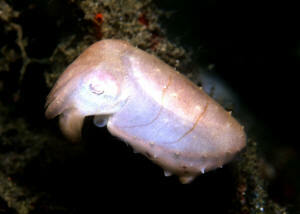 Sepia papuensis Hoyle 1885, Papuan Cuttlefish. Small (60 mm. maximum) with small papillae on the mantle surface, relatively long tentacles. Western Pacific; Australia, New Guinea, Indo., Philippines. N. Sulawesi, Indonesia pix. 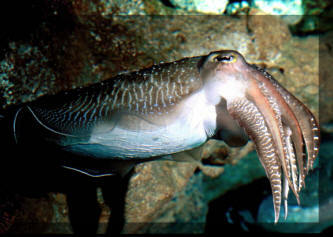 Sepia pharaonis Ehrenberg 1831, Pharaoh Cuttlefish. Red Sea, entire Indo-Pacific. To about eighteen inches in length. Keep solitarily. Lives 2-3 years. This one at the Sentosa Aquarium, Singapore.